After seven months of working on Life Goal #9, I started working on Life Goal #10 this afternoon. 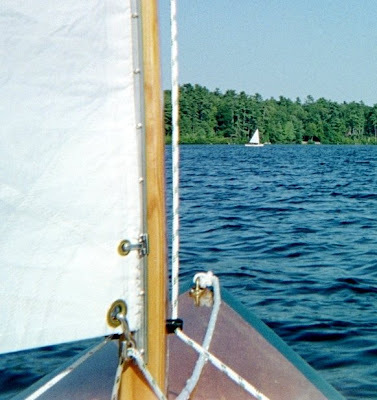 This goal is to learn to sail, and it was a great day for it in Southern NH. Until today, I have only been an armchair sailor, reading books, magazines, and Internet sites about the sport and art of sailing. I was very happy that I did at least have an 'academic' understanding of what to do, and what to expect. I have to say that the 'physical' experience of moving over the water, under the power of wind in my sail was MUCH more fun!!! I chose to launch my recently completed Jimmy Skiff™ in a tidal river which flows into Great Bay, and then joins the Piscatequa River, and flows seven more miles to the Atlantic Ocean. 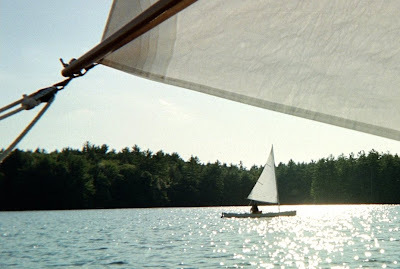 The reason I chose this location for the 'shake-down' cruise was that this is where I was a year or two ago when I was kayaking with a friend, and an older couple raised the sail on a similar size boat and silently, and nearly effortlessly, glided away. This was the catalyst for the ambition which brought me to today. For anyone reading this, if you have never sailed in a small wooden boat, I highly recommend it! When the wind tapered off, I gave the oars a try. This was great fun too! My son took a turn and rowed himself around a bit, then I gave my daughter a ride, while I rowed from the forward seat. Then my wife joined me, relaxing in the aft seat while I happily rowed along. I think that the Jimmy Skiff™ is even easier to row from the forward rowing station, with a passenger in the aft seat. What a pleasure! I think this little boat will get a LOT of use from me and my family, hopefully for a very, very, long time to come. 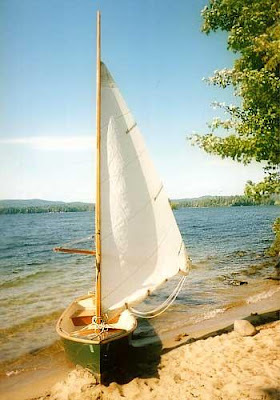 Since this was a boat building blog to document the construction of the CLC Jimmy Skiff™, it is appropriate that today's post will be the final chapter. I will still reply to comments or questions posted by readers of this blog. Please note the index links below to help you to navigate through this blog site.